We have developed all of our recipes to provide the finest range of cakes and desserts. Delicious, reliable, convenient and made for your foodservice business, with all the benefits of being frozen. You'll be spoilt for choice with our extensive range. We would be delighted to see our cakes on your dessert menu, in your fridge, or on your counter. Priestley's Gourmet Delights are only available from foodservice wholesalers for cafes, restaurants and eateries. Introducing 2 delicious new vegan products and another gluten free muffin for your cafe or eatery. All 3 are suitable for ambient (counter top) displays or equally at home in your cake cabinet. Do you need product specs, images or copies of our HACCP and FSSC22000 certificate? These are available for download, along with product handling tips and much more in the "Prep Area". Priestley’s Gourmet Delights has grown on a relentless focus for baking the best possible cakes and desserts for the foodservice market. Our customers enjoy marketing support, product advice and tantalising ideas to create taste tempting dessert menus. 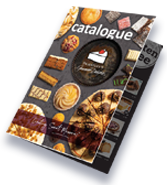 Select from our evolving selection of products including the sought after range of delicious gluten free desserts for your cake cabinet or dessert menu. Irresistible dairy free raspberry & coconut mini loaves. No artificial sweeteners, flavours or colours. A smooth vanilla cheesecake decorated with fresh cream squiggles, chocolate straws and a light dusting of nutmeg. Rich and moist chocolate muffin with chocolate pieces throughout. At Priestley's Gourmet Delights, we are committed to providing you with the best tasting range of gateaux, cheesecakes, tarts, slices and other tempting treats. Our products are supplied frozen for the Australian and International food service markets. Copyright © 2018 Priestley's Gourmet Delights®. All Rights Reserved.